Can Arduino and Raspberry Pi be friends? 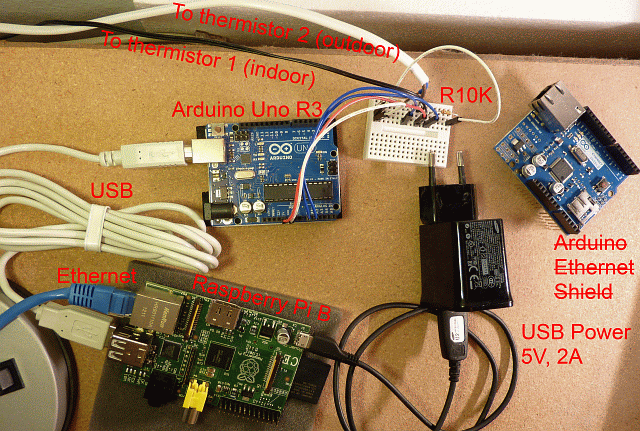 I had an Arduino Uno R3 together with the Arduino Ethernet Shield R3, but I never got the Ethernet Shield to be stable over several days, even for my simple temperature project. Enters Raspberry Pi, a tiny inexpensive (~27€) single-board computer that runs Linux, is stable, cheaper than the Arduino Ethernet Shield alone (~32€), and only slightly more expensive than an Arduino Uno (~22€). On the other hand, to interact with the physical and analogue world, the Raspberry Pi only has some unprotected digital GPIO pins, not safe for a software guy like me. Few extension cards are available so far for the Raspberry Pi, they can be more expensive than an Arduino Uno, and they do not have the same amount of libraries and community as Arduino. The idea: combine Raspberry Pi for the high-level software with Arduino for the lower-level electronics, through a simple USB connection! Furthermore, I want the Raspberry Pi to have an ultra-light Web server that can both be event-driven by the Arduino and send requests to the cloud. This makes a coherent plug-&-play system with good documentation for the different parts. I use a tablet or smartphone charger ETA-P10X (5V, 2A) to power the Raspberry Pi via micro-USB (5V, 500mA or more), which is also connected to the Internet via an Ethernet cable, and to the Arduino Uno via USB. The main storage for the Raspberry Pi is an SD Card (Samsung 32GB SDHC Class 10), out of which I use less than 2GB. The Arduino is connected to a solderless breadboard, forming a basic electronic circuit (voltage dividers) for simple temperature measurement (not detailed). The Arduino Ethernet Shield is not used anymore. In the spirit of Node.js being event-driven and in order to save energy, the Arduino sleeps most of the time and when it wakes up (here, every 5 minutes), it sends some text that generates an event in Node.js. The following Arduino program is meant to measure two different thermistors (Temperature sensor with steel head) in order to report the temperature inside and outside. It is outside the scope of this document to explain the electronic details, as the focus on the interaction between Arduino and Raspberry Pi. Then plug a standard USB cable type A-B between the Raspberry Pi (host) and the Arduino (device). There should be no need of additional power supply to the Arduino. There are already multiple Linux distributions for the Raspberry Pi, nicknamed RasPi . I have chosen the last Raspbian, a Debian Linux customised for the Raspberry Pi, which comes with a nice raspi-config assistant at startup that takes care of expending the system to the full size of the SD Card, etc. However, at the time of the writing, the versions of Node.js an npm available in the repositories were too old. Now we need Node.js to react when the Arduino is talking over USB. When connected via USB to the Raspberry Pi, the serial connection to the Arduino is detected as something like /dev/ttyACM0 and may vary slightly in your setup. And here is the script that I use to react to JSON messages sent by Arduino (i.e. event-driven) by updating the temperatures. It also forwards a copy of the new information to a dedicated Web server via an HTTP POST request, so that the little Raspberry Pi (furthermore on a home Internet connection) can avoid being the front-end Web server if necessary. See the live demo running directly on the Raspberry Pi (when turned on) . Update to a newer version of Node.js and npm. See the current issues such as issue #81. If you expect an answer or to report a problem, favour contacting me by e-mail.